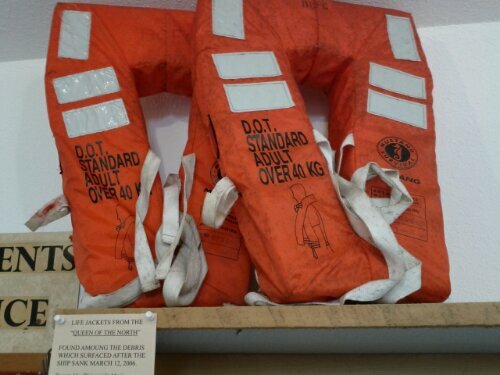 In the Port Clements museum there are two life jackets on display. They washed ashore following the sinking of the Queen of the North. Two people died when it went down. Their bodies were never found. Is this, perhaps, their homage? This entry was posted in Haida Gwaii, Ramble and tagged BC ferries, life jackets, Port Clements, Queen of the North. Bookmark the permalink. 2 Responses to jetsam or flotsam? Gives real pause for thought. BTW: jetsam is stuff deliberately thrown overboard, flotsam is unintentional, like wreckage. I think.